There are numerous advantages to a Bio-Mat, when compared to ANY infrared sauna. The Bio-Mat is less expensive than an infrared sauna. Typically 1/3 the price. You can sleep on a Bio-Mat at night or any time. Infrared Saunas have one setting: HIGH! With the BioMat, there are a variety of settings (9 total) for a variety of issues & concerns. Since you can vary the temperature settings, you can adjust the mat to lower temperatures, so you will be warm and cozy all night. The Bio-Mat uses less power. The Professional Bio-Mat at its highest output uses about 1/4 the power of an EFFICIENT infrared sauna, let alone a regular infrared sauna. Bio-Mats are portable: you can travel with them, or easily move them from room to room. The Mini & Professional sized Bio-Mats come with travel cases. Try taking your FIR sauna on your next trip. The Bio-Mat has FAR DEEPER INFRARED PENETRATION. The Bio-Mat can penetrate 6-8 inches into the body. An infrared sauna penetrates about 1-2 inches and is limited to this due to its technology. The Bio-Mat has a different quality infrared. Because the FIR is modulated by the Amethyst Crystals, this increases the bio-availability of the infrared. The Bio-Mat provides the benefits of Amethyst Crystal healing. With the Bio-Mat, you are on lying on a bed of gemstone quality Amethyst Crystals in addition to the FIR & Negative Ion therapy. The Bio-Mat provides negative ion therapy, which stimulates serotonin, allowing the body and mind to relax, assisting in therapeutic sleep. Negative ions are generated within the Bio-Mat and enter the body through conduction. Negative ions are only generated in those saunas where water is poured onto hot rocks. A unique feature of the Bio-Mat is that it produces a 100 milligauss magnetic field to assist circulation in the body. The Bio-Mat is designed to shield your body from harmful EMFs whereas a FIR sauna has no such protection; these saunas actually surround you in harmful EMF's. The Bio-Mat is a FDA registered medical device. Uses a metallic coil to produce heating that consumes extra electricity and could possibly cause a fire. Produces no negatively charged ions. Produces little, if any, useful infrared waves. If the human body comes in direct contact with the heating pad/mattress, there are many harmful effects to the body. 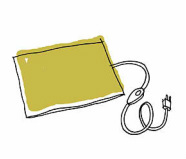 Because a heating pad uses Aluminum Foil and Copper Fiberglass, it cannot cut off harmful Water Vein Waves. Heating pads often cause 'hot spots' or 'burns' on the skin and sometimes even underlying muscle tissue. Effects of the heat dissipate within a few minutes. Saves on electricity by using the Japanese created Kurare Carbon Ceramic (Patent 1386560), which reduces electrical consumption 60% or more as compared to other electrical mattresses and uses no electric coils. Emits negatively charged ions to transform harmful ions into helpful ‘negatively’ charged ions in the human body. Negatively charged ions give strength and energy to the human body and relieve pain. Uses the Japanese developed Kurare Super Fiber Material to generate Long Wave Infrared Rays [8-12 Micron length], that the human body can easily absorb. Four stage process that intercepts or greatly reduces detrimental electromagnetic waves using the most advanced I.C. chip. The computerized control unit converts A/C power to D/C power to assist this process. A special layer of double Aluminum Fiberglass completely cuts off harmful Water Vein Waves [a naturally occurring EMF that comes up from the ground]. The heat of the BioMat is evenly distributed to the body. Effects and warmth can continue for 2-4 hours after a BioMat session because the FIR have deep reaching qualities. 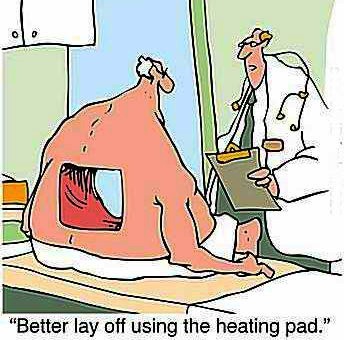 Humorous illustration of 'hot spots' from standard heating pad use. Notice the heating differences between these two thermal scans. The BioMat shows more even heating and deep penetration whereas the heating pad has many 'hot spots' and many cold areas still remain on the back.